by Kennon L. Callahan. Jossey-Bass, 1997. Does your congregation keep missing its ministry goals? Do you feel like there is something inherently unhelpful about your congregational budget process? Popular author, church consultant, and pastor Kennon Callahan addresses these questions and more as he offers readers a process for implementing effective financial practices that support ministry and lead to healthier congregations. For Callahan, effective financial practices begin with a mission budget and a corresponding fundraising plan. Despite being published nearly forty years ago, Callahan’s book continues to educate and challenge readers. 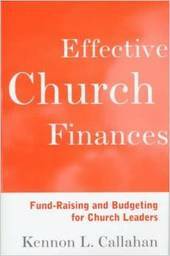 He defines different types of budgets, suggests alternatives to cutting the budget, and considers the value of knowing congregational giving patterns and fluctuations. Callahan includes several worksheets for congregations to use to assess, analyze, and evaluate their current financial practices. These worksheets will help clergy and lay-leaders from a variety of traditions imagine an exciting and rich ministry-filled future.